The holidays are coming. Can you even believe it? In just over two weeks we will be celebrating the Thanksgiving Holiday and then Christmas. Is it just me, or do the holidays come fast for you too? I’m pretty excited for them. I get excited every year, but I’m super excited to share my baby girl’s first holiday season with her this year. We’re going to have fun! We’re also going to eat well. Turkey seems to be the main protein choice at most holiday events. Considering that turkey is an excellent lean protein, I am happy that this is the case. Now, we just need a good recipe and cooking method to ensure we get the perfect meat. It all starts with the brining. I know it requires a tad bit more effort (and really, it’s just a tad), but it is SOOOOOO worth it! 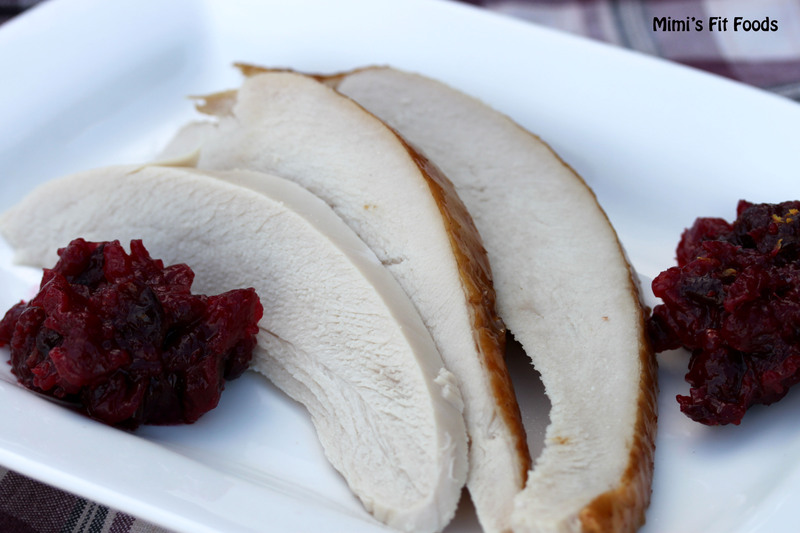 The brine not only allows for a VERY moist turkey, but it also helps to infuse flavor into the meat. 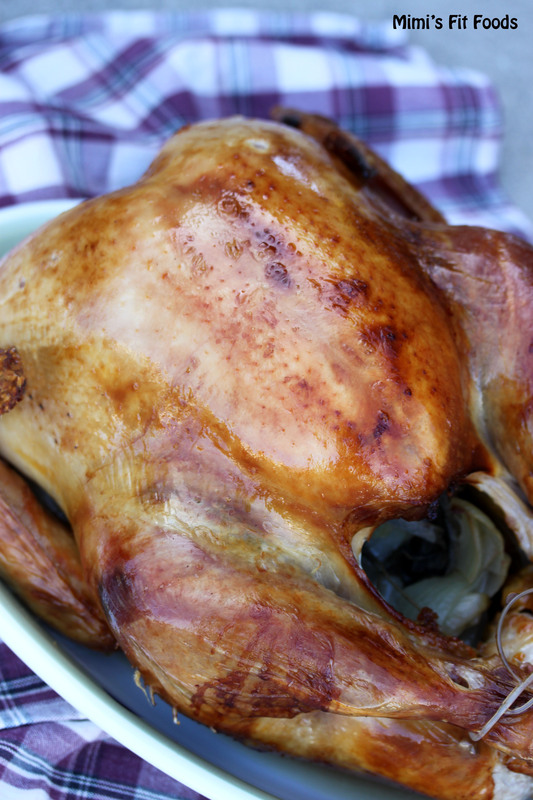 This replaces any need to baste your turkey (which really doesn’t add flavor to the meat . . . only to the skin AND by opening your oven several times during roasting to baste just dries out your meat). If you’re interested in the science of how/why this is so, you can watch a little video here. It explains the science of brining and Alton then shows how he prepares his brine. Once the turkey has set in the brine overnight, then all you do is rinse the turkey, pat it dry, rub it with some canola oil, add some simple aromatics to the cavity of the bird and roast it! As crazy as it sounds, you actually don’t roast it in a roasting pan (or in a turkey bag). You’ll put it on a roasting rack placed in/on a half sheet (jelly roll) pan. This allows for an evenly roasted turkey. You’ll start with a high temperature (to brown and crisp the skin) and then you’ll reduce the temperature for the remaining roasting time. For those of you who are visual, you can watch Alton Brown prepare and roast his turkey here. For the short and quick version, click here. I know the videos can be helpful, especially if you’re attempting a roasted turkey for the first time in your life. Warning: The videos are a little old, but the science and method are still VERY current. Now, start planning your holiday dinners and be SURE to include this roasted turkey. You will NOT be sorry! And, can I ask a small favor? Do you mind bringing me your leftovers? Combine the vegetable stock, salt, brown sugar, and peppercorns in a large stockpot over medium-high heat. Stir occasionally to dissolve solids and bring to a boil. Then remove the brine from the heat, cool to room temperature, and refrigerate. Roast the turkey on lowest level of the oven at 500 degrees F for 30 minutes (there may be some smoke created towards the end of this 30 minutes, but do not fear). Insert a probe thermometer into thickest part of the breast and reduce the oven temperature to 350 degrees F. If needed/desired, cover the breast section with foil to ensure that it doesn’t brown too much and so you get perfect roasting between dark meat and breast meat (I followed Alton Brown’s suggestion in the video to fit a piece of foil to the bird before I put it in the oven so that all I had to do was set the foil on the bird at this point.) Set the thermometer alarm (if available) to 161 degrees F. A 14 to 16 pound bird should require a total of 2 to 2 1/2 hours of roasting. Let the turkey rest, loosely covered with foil or a large mixing bowl for 15 minutes before carving. That turkey looks really, really good! Thanks for sharing! !